I love interior design and especially the challenges of remodeling a tiny apartment into something fabulous. 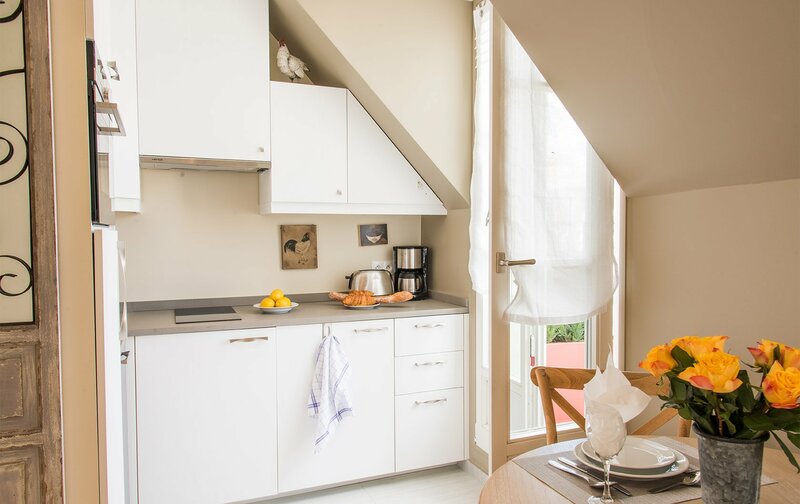 Paris is one of the best places to transform small spaces – apartments are generally not as spacious as the USA. Done well, even a petite apartment can seem grand with the right design. 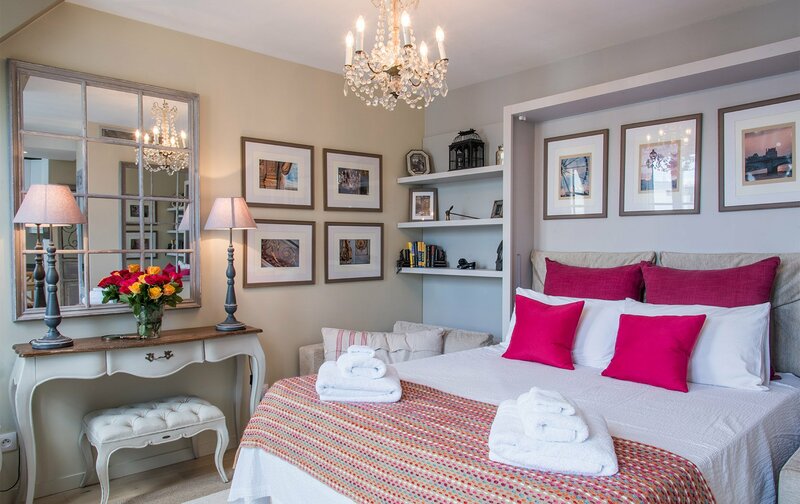 We had the pleasure of remodeling a darling apartment called the Saumur for some new owners. My amateur photos don’t do it justice, but we believe we solved the most important problem, creating a spacious living room and a real bedroom in this tiny space (only 270 square feet). First up was gutting it and improving the layout. The apartment was in dire need of redecoration, not having been touched since the 1970s. Can you believe it? 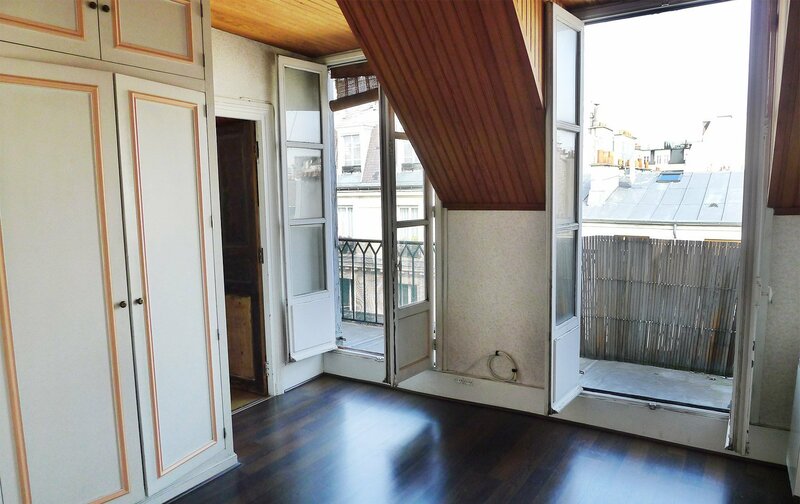 BEFORE: The balcony with attractive views of the pedestrian street below. BEFORE: The cupboards on the living side were so large that it shrunk the living space dramatically. 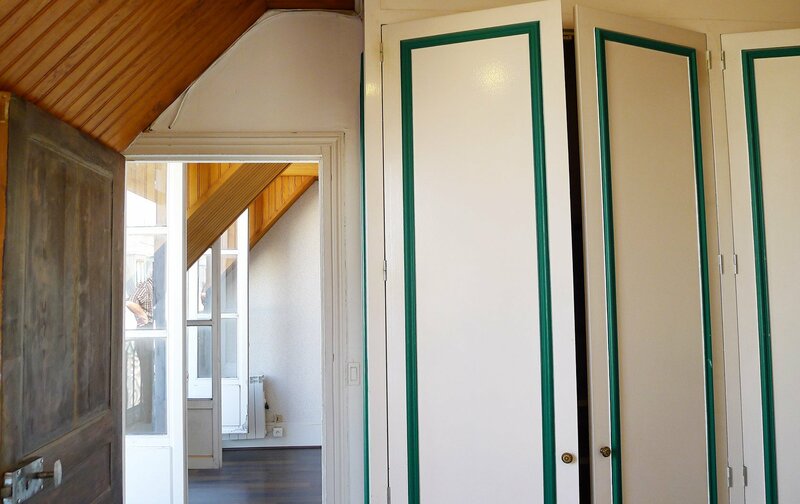 BEFORE: There was just far too much storage for an apartment that only accommodates two people. And the wood-covered ceilings and eaves made it feel even smaller. BEFORE: The most interesting feature was the installation of 1960s style wood paneling everywhere including the ceilings and the mansard area around the French doors, however, it made space even more constricted. 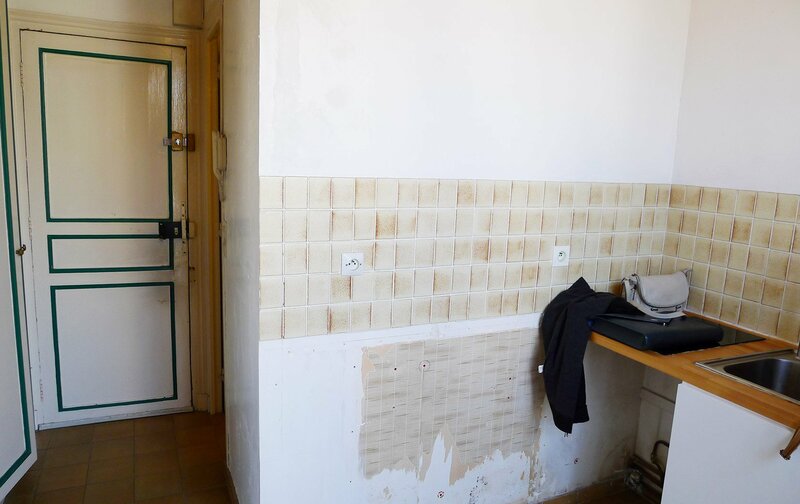 BEFORE: The previous tenant had removed everything from the kitchen, standard practice in France. Tenants normally have to equip their rentals all the way including kitchen cabinets and appliances. I initially wanted to convert the kitchen area into a tiny bedroom. 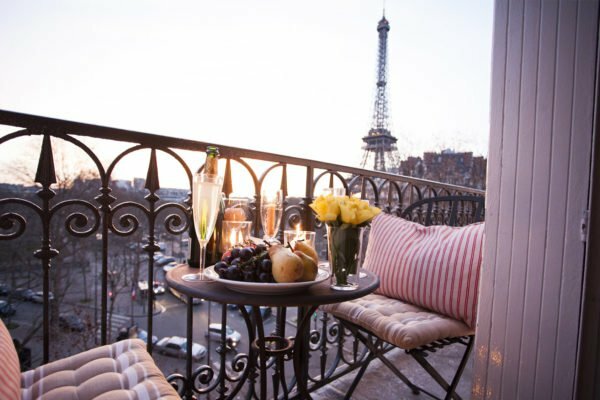 But it would have reduced the space, especially the line of three beautiful sets of French doors that opened onto the terrace. The challenge was on! How could we create a gorgeous living room and an equally gorgeous bedroom at night? The most important aspect was creating a living room that felt large and comfortable but could easily convert to a cozy bedroom at night. One option was to buy an excellent convertible sofa like the ones we import from Italy and use for many owner apartments. Italians are the masters of design and comfort for small spaces. 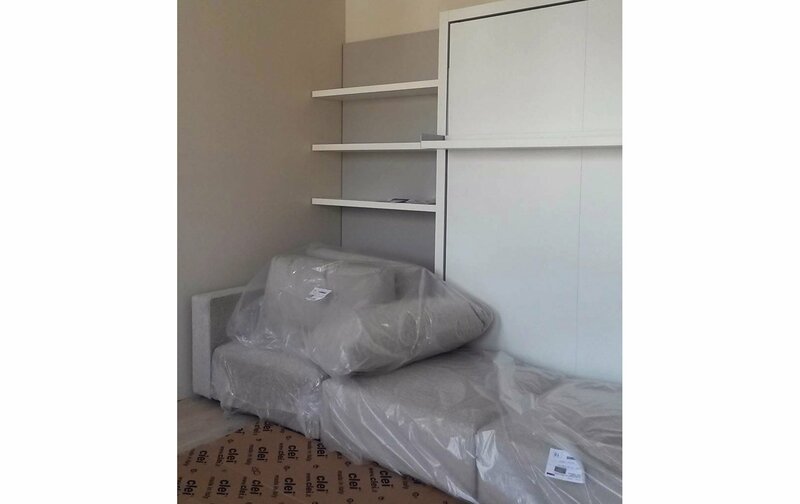 But this time, our owners wanted more – both a sectional sofa and a Murphy bed that pulled down from the wall. Daybeds are common in the US but they were not what our owners wanted. For American designers, it’s a difficult challenge because there hasn’t been a lot of design innovation for small spaces. Our owners didn’t want to buy a queen-sized bed which would serve as a daybed like the one below. We agreed, they’re not particularly comfortable and take up a lot of space. We didn’t want a queen-sized daybed stuffed with cushions to take up the entire room. They are never comfortable for seating and it’s a pain to remove all the pillows at night. We work with a leading Italian design company that makes wall beds, or Murphy beds, as mentioned. Measuring only 15 inches deep they perform the entire function of a living room or bedroom with their clever design. You simply remove the two back cushions and pull down the shelf. Voila! A queen-sized bed. An added bonus? Even the items on the shelf stay put as you lower it. An image of the bed from the catalog. We presented the idea to our owners and they loved it. I contacted the company in Italy; I’m lucky to have learned Italian when my father was stationed there as an Air Force pilot. I spoke with the manufacturer, who suggested one of their best selling sofa/Murphy bed models along with installation in Paris. Then, came the long price negotiation (this is typically Italian but necessary). ‘Un piccolo sconto’ – or a small discount – was offered on the unit and also a fantastic deal to drive it from northern Italy to Paris and have professionals install it for us. The price was about €9,500 for everything, which initially seemed like a lot. 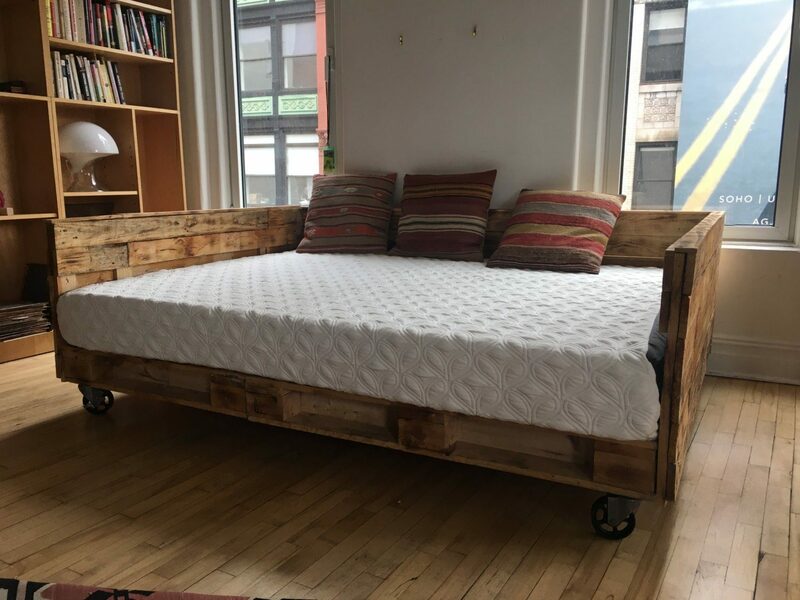 However, it was for the whole package and included: a large three-seater sofa, ottoman, bookshelves, a closet, an excellent bed, a mechanism and even an LED reading light feature in the bed. In the end, the cost wasn’t a lot more than a high-end sofa with an ottoman and a queen-sized bed. And, it was the best quality we’d ever seen. I carefully measured every angle to make sure all pieces could be carried up the staircase. Like all the best transformations, we had many challenges. Signor Domenico and his brother drove the bed overnight to Paris and arrived on Rue Cler early the next morning to meet our builder. They were allowed to park outside in the morning in order to unload the boxes, the mattresses, sofa, and shelves. 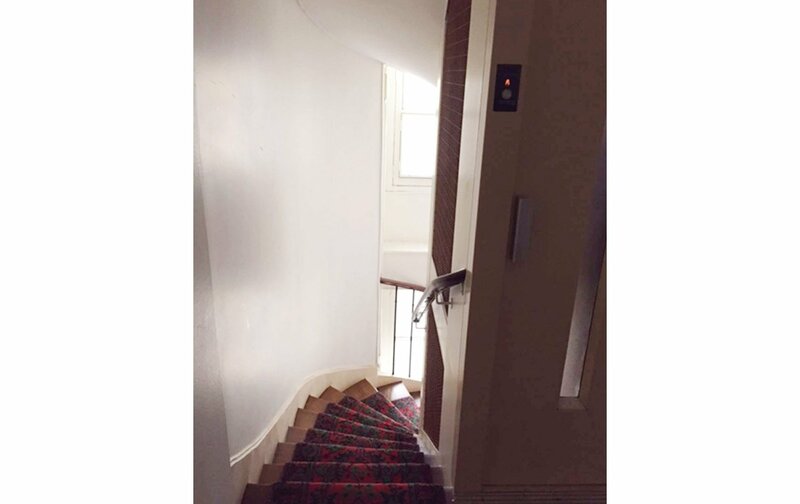 All went to plan until the largest piece (measuring 160 x 200cm or 63″ x 82″) would not fit up the stairs. They made it all the way to the 6th floor (7th in the US), only to find it would not turn the last corner into the apartment. Nightmare! 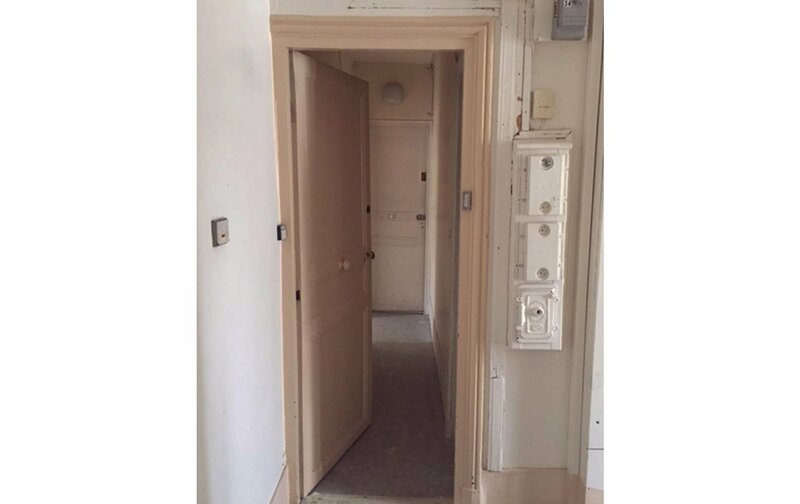 “Ecco il corridoio per entrare l’appartamento.” (Here is the corridor to enter the apartment). I remembered the turn from the top of the staircase through this doorway. 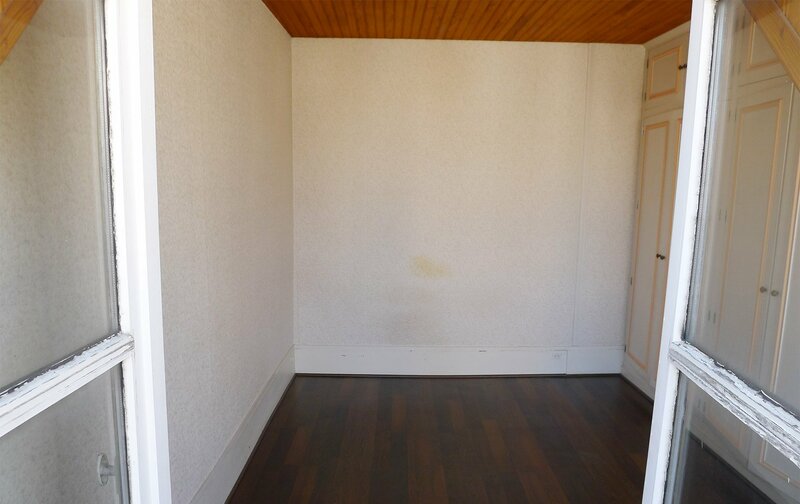 But I forgot that final disastrous left turn from the end of the small corridor into the apartment. Oh no! After numerous calls, our French-Polish builder called a contact at a company which rents outside elevators. They’d just had a cancellation and had a truck was available that afternoon. At €300, the price was a bargain, especially compared to having no sofa or bed at all. 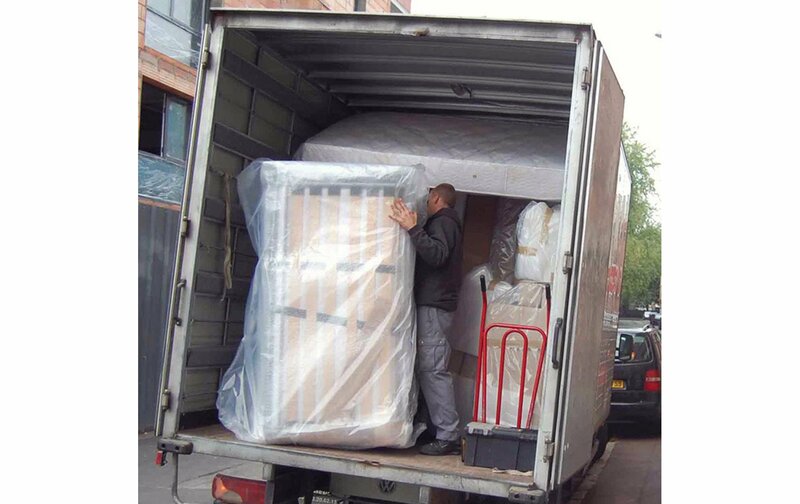 A last-minute change – hiring a truck with an elevator to carry the sofa to the 5th floor! Finally, it was a success! 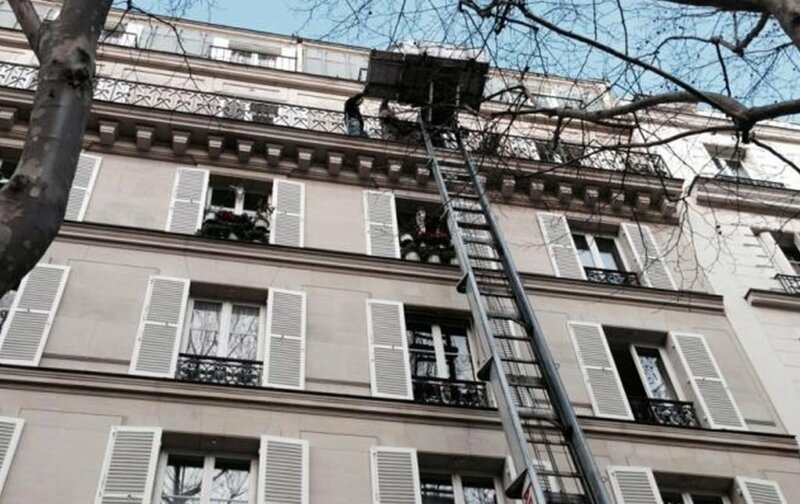 The last big piece was lifted to the balcony via the outside elevator, slid over the railing and through the French doors into the apartment. Domenico and his brother assembled the system perfectly. Although we offered them an apartment for the night, they decided to drive to Geneva where a client was waiting for another installation. They took us up on our offer the following spring, when Domenico brought his wife and daughter. We were so lucky to have met and they’re welcome to visit anytime. After all the challenges, the apartment looks stunning! Here’s the brand new Saumur. Don’t you just love it? AFTER: The balcony is a cheery spot for relaxing. AFTER: The living room with the queen-sized bed above the comfortable sofa. AFTER: A real transformation – the spacious and comfortable bedroom at night. It’s easy to fold the bed down behind the sofa. AFTER: The living room during the day, equally comfortable and also the view towards the kitchen. Storage closets are on the other side, providing plenty of storage for all. AFTER: The Saumur living room looking toward the balcony. I painted the industrial style coffee table a pale beige and installed wheels on it, so it can be easily moved to lower the bed. AFTER: The dining table between the kitchen window and French doors. BEFORE/AFTER: Soft limestone colors in the new bathroom. BEFORE/AFTER: The living area before and after. A total transformation! 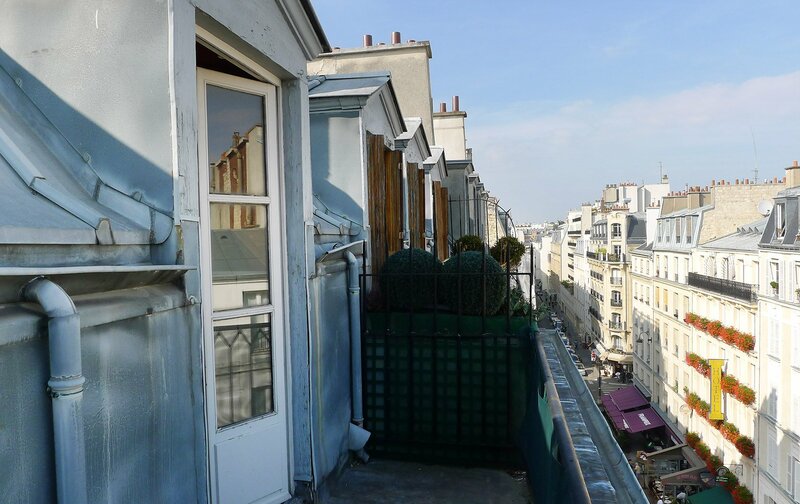 BEFORE/AFTER: The terrace is a true masterpiece after the renovation! 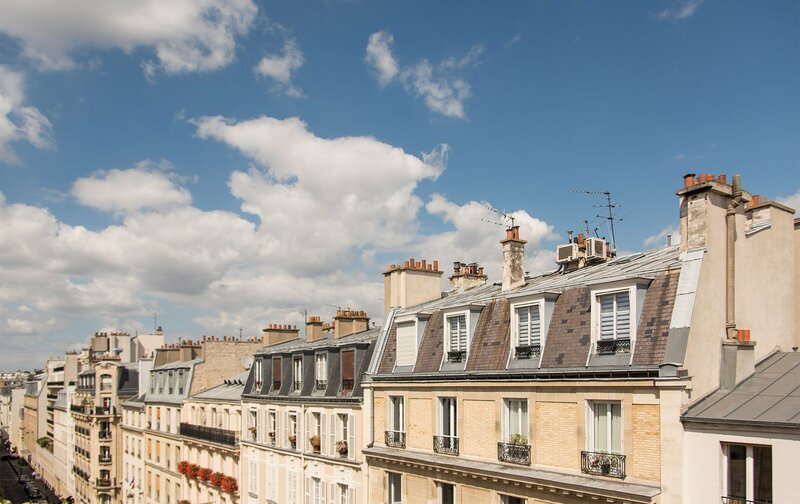 The Pièce de Résistance, or masterpiece – the amazing terrace! Guests say it’s the other living room – they’re right. It’s a pleasure to sit outside and take in the bustling food street Rue Cler below. 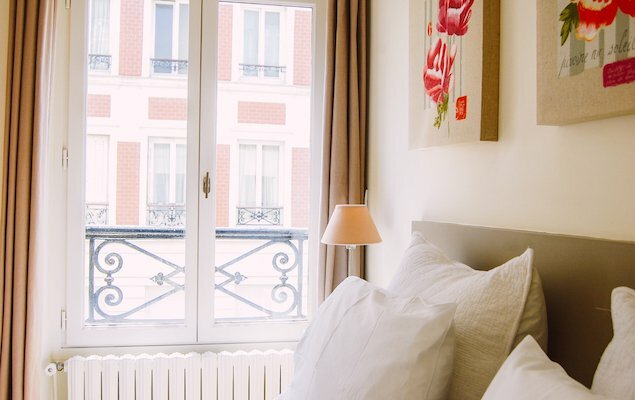 Double-glazed windows and air conditioning mean you have peace and quiet when you’re ready to sleep. 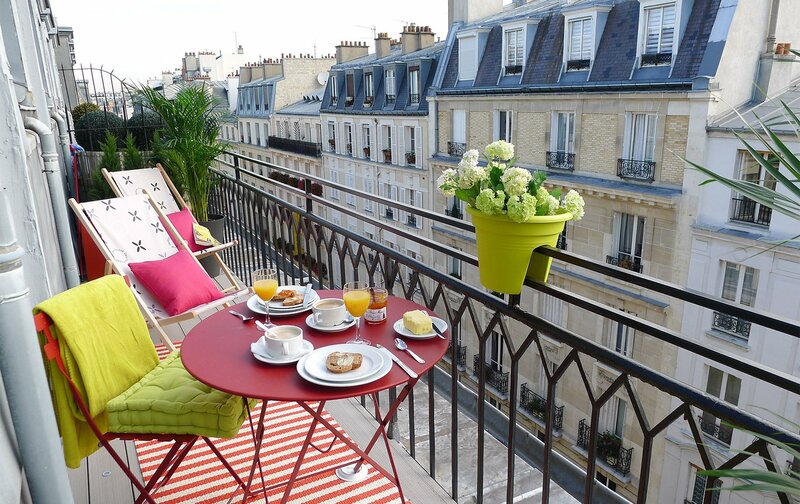 The terrace with its double French doors was the main selling point. There’s a third French door to the left in the new kitchen. Teak flooring was laid outside and solid oak floors were installed in the living room. BEFORE/AFTER: The living room as viewed from the kitchen and dining area. Now, when you walk into the living room from the kitchen, it’s just spectacular. 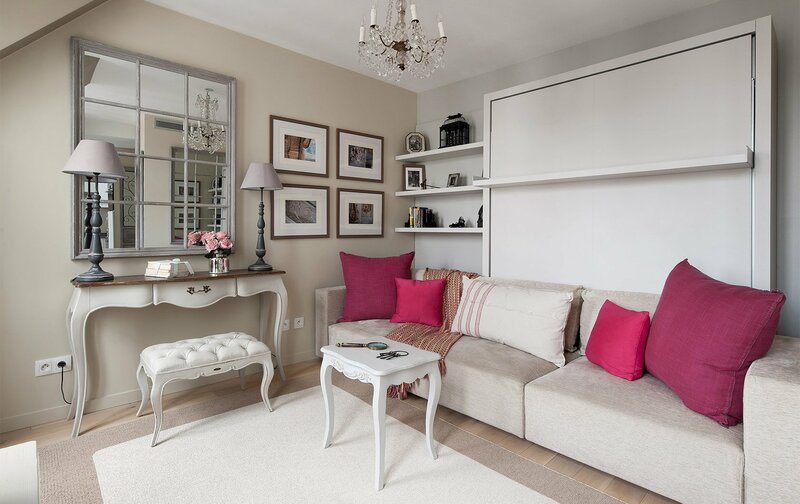 Beautiful soft colors and large mirrors add to the feeling of space. Our owners love staying here. BEFORE/AFTER: Looking into the living room from the terrace before, plus two after shots of the same view. Removing the deep closets was the best design idea, creating a roomy living room. 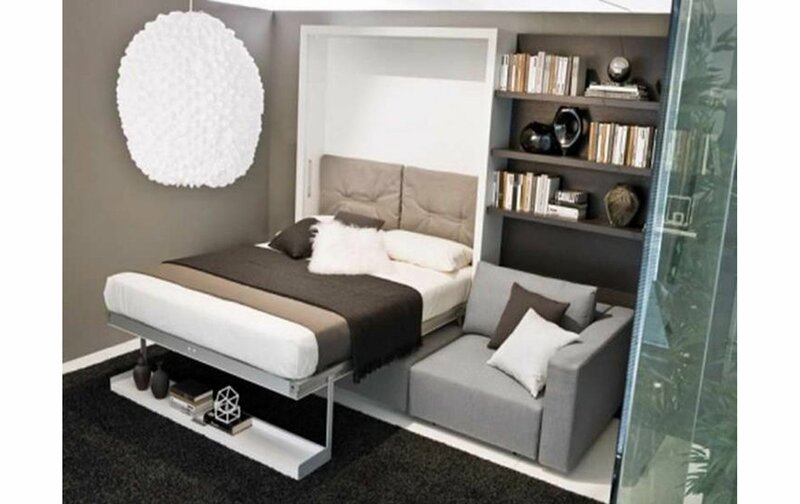 This living room easily transforms into a bedroom at night: simply pull down the shelf behind the sofa. The luxury queen-sized bed and mattress are the highest quality from Italy, ma certo, bien sûr, or in English – of course! BEFORE: Dull and nothing special. AFTER: A bright and sunny terrace. 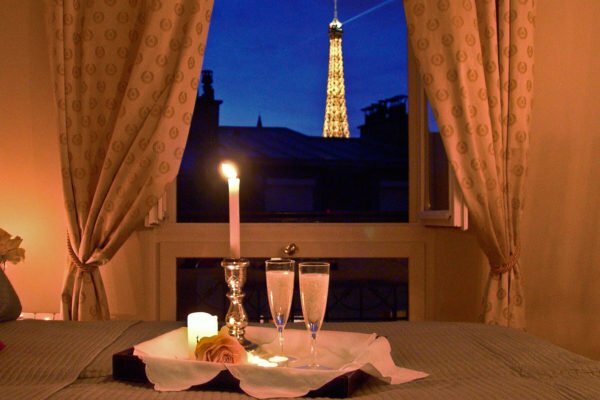 It’s the most amazing part of the Saumur apartment. It now has teak floors, some luxurious touches, and a location to die for! We finally did it and what a handsome transformation! 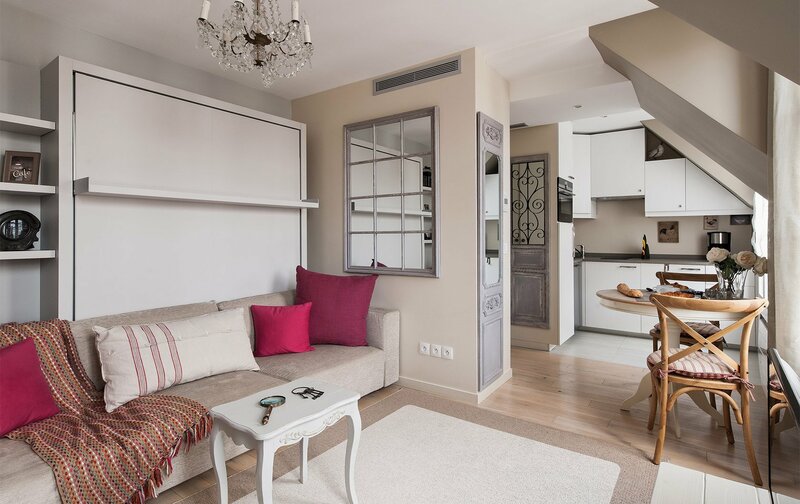 I hope you’ve enjoyed this before and after look at the remodeling of our Saumur apartment in Paris. Let us know your favorite space-saving tips and ideas for small spaces. 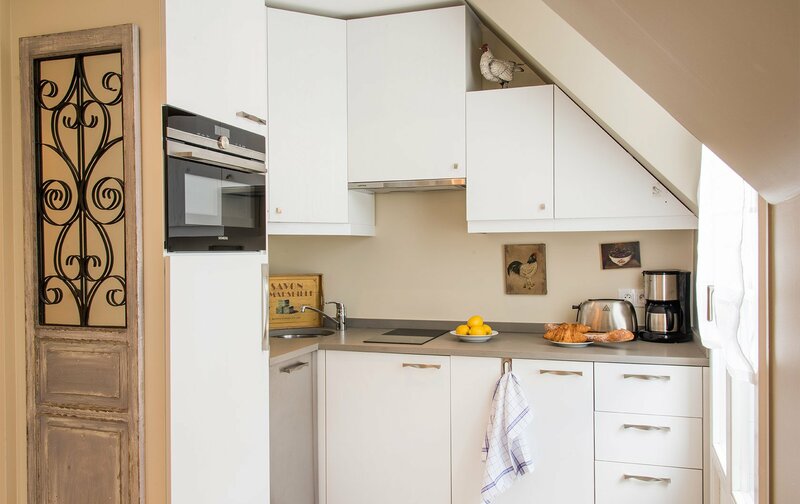 And, if you love the look of this charming little apartment, visit the Saumur page to see more photos and book your stay overlooking fabulous Rue Cler in Paris. 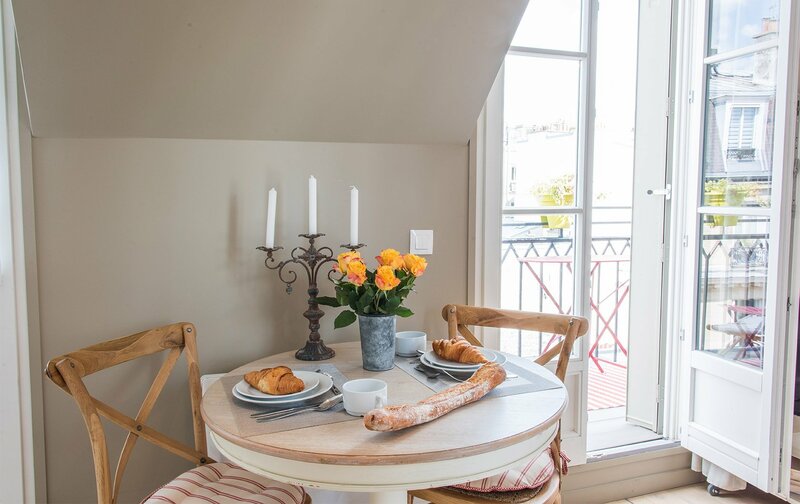 For your next stay in Paris, our friendly reservations team are on hand to help you select one of our stunning family vacation rentals. Posted on Tuesday, March 20th, 2018 at 3:52 pm in Apartment Rentals. You can follow any responses to this entry through the RSS 2.0 feed. You can leave a response, or trackback from your own site. 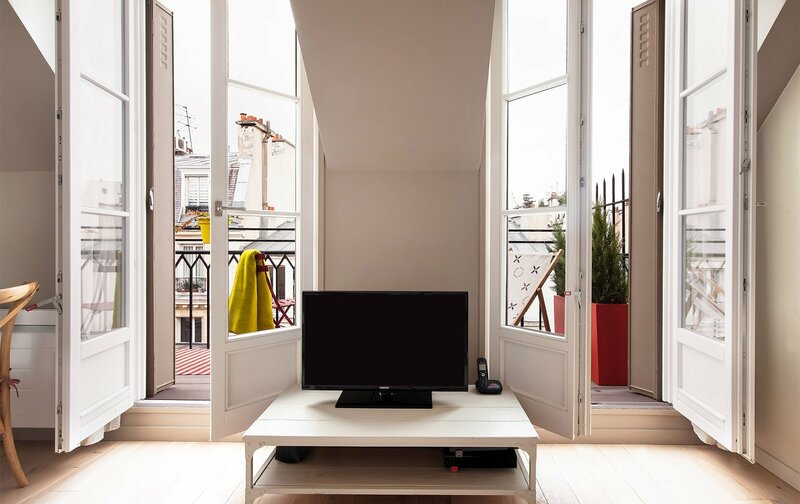 The Merlot Apartment: An Amazing Small Home Remodel in Paris Can This Apartment Be Salvaged? – An Update! 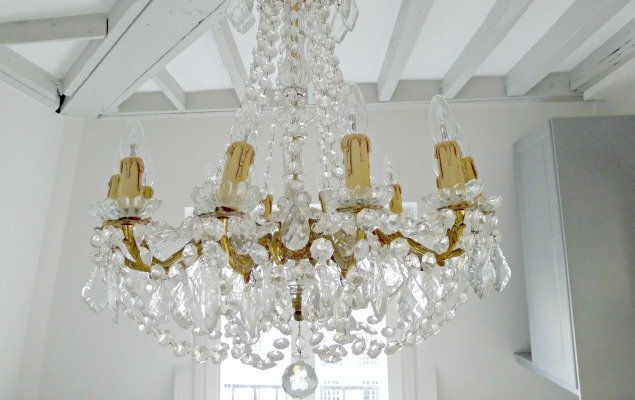 My Paris Perfect Week in the Barsac Apartment Presenting a New Paris Apartment, the Quincy!